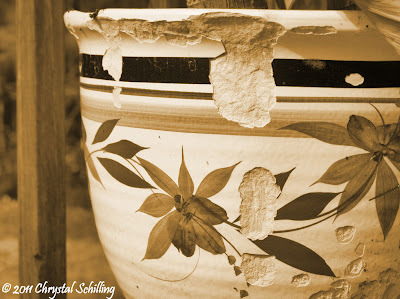 The elements have really taken their toll on this flower pot. We've had it for a long time and between all the times we've moved and the sun, rain, cold, etc. that it has been through, it is looking a little beat up. I gave this photo a sepia tone. Also, this is my first try at an HDR image. HDR is High Dynamic Range and when you use this technique, you merge multiple photos of the same composition that have different light levels. I've seen some amazing HDR images. Mine is no where near amazing, but it was fun to see what my software could do. Settings for this photo are: f/8, ISO 400. The shutter speeds vary.